What a treat! Here’s a book about music, written by authors who know music and musicians inside out. But it’s far better than merely ‘well-informed’. Meurig and Rachel Bowen possess that sort of deep-rooted knowledge that enables them to delight in the idiosyncrasies, the ironies and the quirks of the musical world. Their ability to share their passion, their sense of humour, and sometimes a real sense of bewilderment at the extraordinary nature of music and those who create it permeates every page of this joyful celebration of sound. The brainstorming collaboration of husband and wife team targets the 7-11 age group so I shared it with my musically-experienced 11 year old daughter. The book is ambitious in scale: right from the start, it is clear that it is going to be addressing ALL musics in 93 richly and gloriously illustrated pages. Upon the reader enrolling at the School of Music, it is elegantly structured into lessons over three terms. ‘I think that helps children dip into it’ said my daughter; ‘you don’t have to read it all at once’. She also pointed out just how much of the pages are lavishly drenched in Daniel Frost’s captivating illustrations. Its a visual triumph – no two pages are alike and the drawings support the text to help even the youngest reader grasp the more advanced ideas. Its quite astonishing how much the authors manage to pack into this book. Whilst it covers some basics of musical theory in an enlightening, reader-friendly way, it is the big, open-ended questions that the authors are unafraid to address that give it a remarkable freshness and a contemporary, relevant feel. 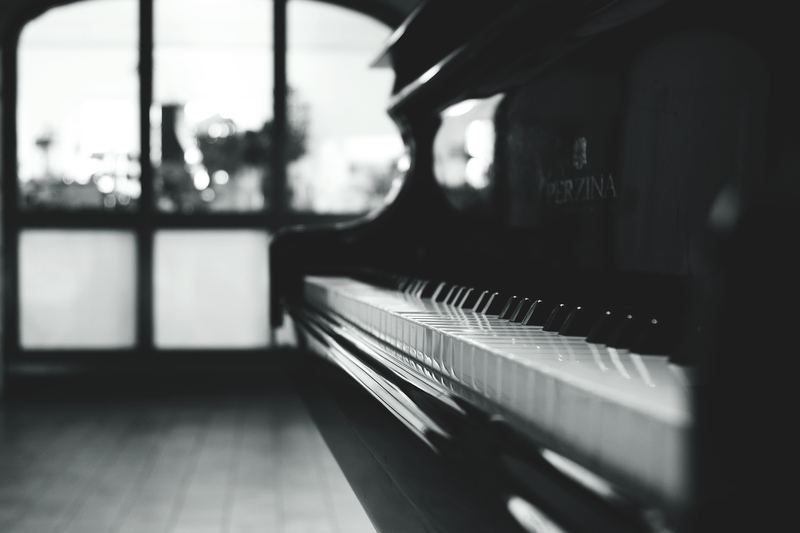 ‘Why is music good for us? How can we develop as composers? 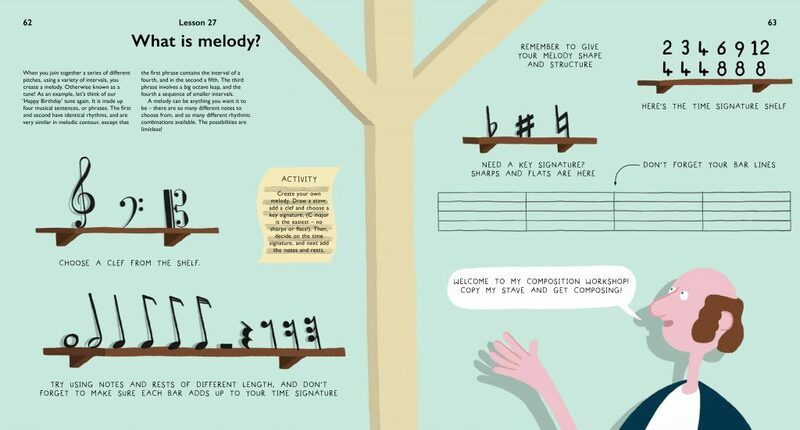 How can we memorise music, share music, combat nerves? ‘I love how it deals with things apart from just playing and reading music’ said my daughter. 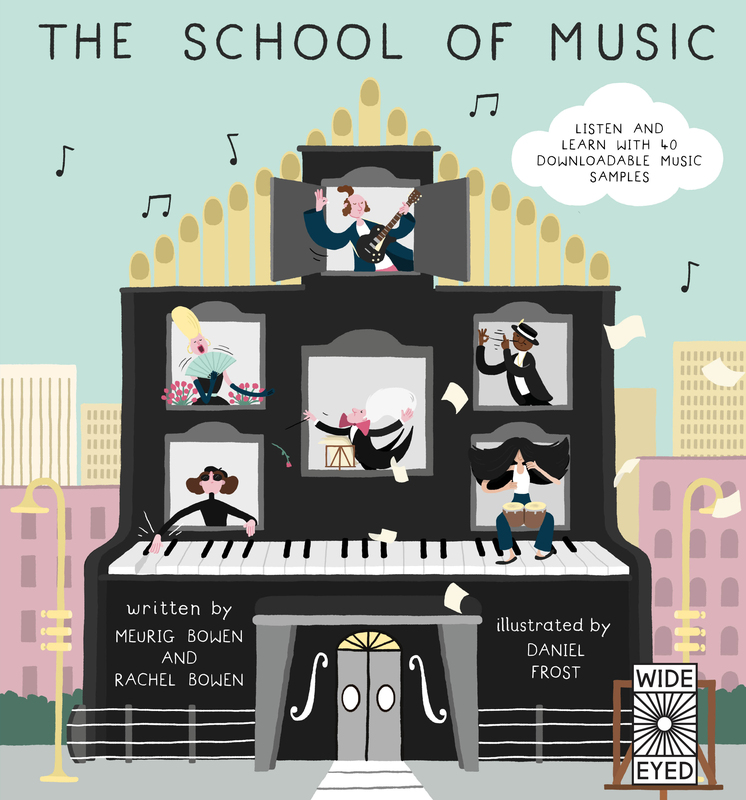 I love that too – finally a book that opens the lid on the musical infrastructure and isn’t afraid to introduce kids to the concept of a ‘Director of Musical Studies’. Who knows…some may want to become one? And it’s funny too! We both enjoyed the gentle caricatures who make up the professors of the School. There’s the Head of School, Sergio Trunk (How important is the size of a conductors stick, Maestro?‘), the composer-in-residence who is so poor that he literally lives-in-residence in the attic of the music school. My daughter noted the consistency throughout the book; ‘I like the way that the teachers keep coming back to explain things’. She paused on one of the theory pages; ‘Hmm..this is actually really very useful’ she said, peering at a pictorial explanation of different clefs. There are discussions on music and movies, dance, jazz, pop, even lessons on music and architecture. And throughout the book are superbly thought-out hands-on activities to help children get involved. There are exemplary online musical examples too of the highest standard. I can’t recommend this book enough for any small person showing an interest in music. The message is warm and wonderfully inclusive; the musical world is wide, fascinating, extraordinary – and there is something for everybody. And as a primary school teaching aid, I find it hard to believe there is any other single source so richly endowed with information, ideas, examples, and activities, all working together to nurture a deep love of music.